Do you aware that enabling IP forwarding using Windows XP Professional will make it as a simple router, so that you can have 2-3 different networks at home and those computers manage to talk to each other from different network. 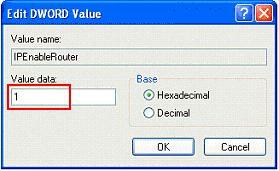 The router is needed to send/receive the traffic from one network to another network or access Internet. The benefit is you don’t have to buy additional router and so can save some money. This approach is not so common practiced in Windows XP, but it works. 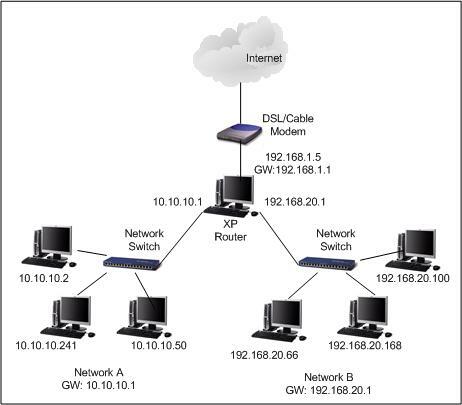 As an example, let say you have 7 computers and 2 network switches, and need to create 2 networks that can access Internet, so how to do it?? Some more information, one of the computers is equipped with 3 network cards and one of the network cards is connected to cable/DSL modem to access Internet, so this computer will act as a router! 1) Go to Start and click Run…, then type in regedit to run registry editor. Note: Please note that only System Administrator can run registry editor. Note: Be extra careful when you deal with registry editor, wrong editing will crash you Windows OS. Note: When I did the test, IP forwarding will only work after rebooting the computer. So don’t forget to do it. Note: If you feel the above process is too troublesome, advise you to get a wireless router or wired router and set up a simple network. It's much easier!! 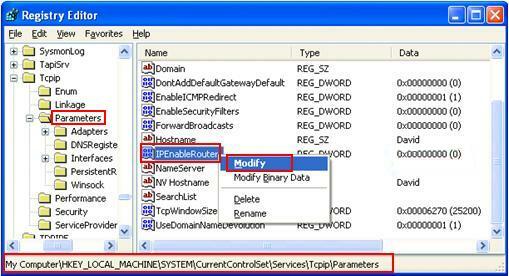 Return to top of "IP Forwarding - How to make Windows XP as a Router"